Spot IT security holes and minimize breaches by going far beyond the traditional manual review of Active Directory audit logs. Netwrix Auditor for Active Directory automatically configures your audit policy so you can get actionable analytics about all activity in your AD environment and harden your security. Because Active Directory is a critical system in your IT environment, ensuring that no unauthorized activity occurs is the top priority for your IT team. Native Active Directory security logs do provide some insight into what activity occurred in your IT environment, including changes and access events. Using these audit logs, you can put the pieces of the puzzle together and figure out what exactly happened. However, this requires a lot of manual work, from crawling through all Active Directory change or logon/logoff logs to deciphering and analyzing the cryptic data. This process is both stressful and error-prone, leaving your organization vulnerable to a wide range of threats. You need a solution that delivers actionable audit information in order to watch for threats and prevent breaches more effectively. 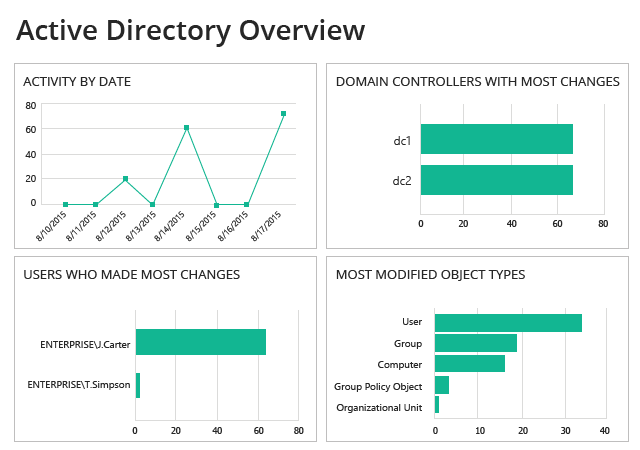 Netwrix Auditor for Active Directory automatically detects and reports on what’s going on across your AD and Group Policy, making it easy for you to determine who made what type of actions took place, when and where each one happened, and the before and after values for changes. Moreover, its security analytics capability is not limited to analyzing audit logs. Its Audit Assurance™ technology correlates information from multiple independent sources and transforms raw data into meaningful and actionable intelligence. Plus, you can install the solution on your Windows Server in minutes.